There are over 7 billion people on the planet. How many will be on the planet in the year 2214? I’m still riffing on the future (for the sci-fi novel I’m about to start working on) as I try to think about what the world will be like in a couple of hundred years. Last time I pondered what kind of transportation systems might exist, because I don’t think air travel will last much longer. Today I’m pondering another important question–how many people will be on earth in the future? 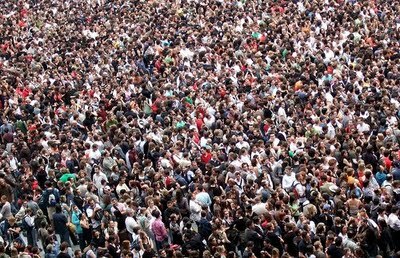 In my lifetime the world’s population has almost doubled (from 3.7 billion to 7.2 billion, according to geohive.com). Needless to say, the number of people in the world greatly influences the way people live. It will not be long until world population reaches 10 billion and then 15 billion is right behind that. How many people can the earth sustain? Many film and literary representations of the future assume overpopulation and the corresponding problems. Thankfully, not all of these films are not all as bad as Soylent Green, but population and scarcity are the backdrop of the dystopia for most futuristic world-views. If you’re having a hard time thinking about it, just remember it is called The Hunger Games for a reason. What I am asking, and pondering of myself, is do I think there will be overcrowding in the future? I have decided, at least in my futuristic world, that it will not be. Part of this is because overcrowding is so overdone, but another part is that things tend to thin out. I can think of several ways that the human race will become thinner (in numbers, not in body weight) in the future. 1. Disease–It doesn’t take too much imagination to dream of a drug resistant harbinger of death that devastates world population. Even as a I write this blog, there is much discussion about a very frightening nasty called MERS coming out of Africa. Global traffic and trade might make the Spanish influenza epidemic of the early 20th century look like a runny nose. 2. A Meteor–Science tells us it took out the dinosaurs, it might take us out too. I do think we might be able to survive better than the dinosaurs, but not in large numbers. 3. A Supervolcano–If a supervolcano erupted, say, underneath Yellowstone, humanity would survive but not until significant percentages of the population died in the resulting ecological disaster. 4. Toxins–It just seems to me that human beings keep putting so much toxin into the air, water, and food, that eventually people will start dying off in large numbers. 5. War–this is the most likely scenario. It may only be a matter of time before Pakistan lobs a nuke at India or Iran figures out how to get one airborne and aimed at Tel Aviv. Plus don’t forget Putin has his finger on a very large arsenal of atomic weapons. Even if nukes aren’t used, conventional warfare alone, with the advances in technology, could wipe out an entire continents. 6. Exodus–People leave when overcrowding becomes a problem. The colonization of Mars will not happen during my lifetime, but in 150 years, it could be conceivable that human beings will live and thrive on Mars. If so, humanity might get siphoned off to live elsewhere. I haven’t yet made up my mind about how I am going to thin out the human population for my science fiction book about the future, but I do believe a world with fewer people is probably more likely, scientific, and interesting. I’d love to hear what you have to say about it. the Bible is true, and i want my work to reflect a biblical worldview in the context of what a future world might be like. i do not want to make an apocalyptic book as much as a book about the future. at least, that is what i am shooting for. i did ask, and thanks for sharing! i agree with you. the more and more i ponder the future, i think human numbers will decrease. not to the point of near extinction or anything like that, but, perhaps a planet with 2 or 3 billion on it rather than the 7 billion right now. thanks for commenting. it is so good to hear from you! Next Next post: DOES THE BIBLE HAVE LIMITS?